I admit, I boarded the hype train for Evolve when it released all those weeks ago. It looked like it would be the modern day Left 4 Dead for my group of friends, promising hours upon hours of hunter/monster co-op goodness. It did certainly keep us entertained for a while, but we moved on – something many other people seem to have done too because the overall player base is now tiny. I’m sure it’s not quite what Turtle Rock envisioned, which is why they are looking to pull players back in with rewards via community challenges. This weekend between 12:01 AM ET on Friday, April 10 and 12:01 AM ET on Monday, April 13, we need to land 1,000,000 successful rock throws on Hunters with Goliath. If we pull this off as a community, everyone who plays between those days and times, snags the Goliath Voodoo skin, absolutely free. Get into Evolve this weekend as Goliath. Toss rocks at those pesky Hunters. Reach the goal, and we all score the skin. Simple as that. Last time we hunted together, now it’s time to kill alone. 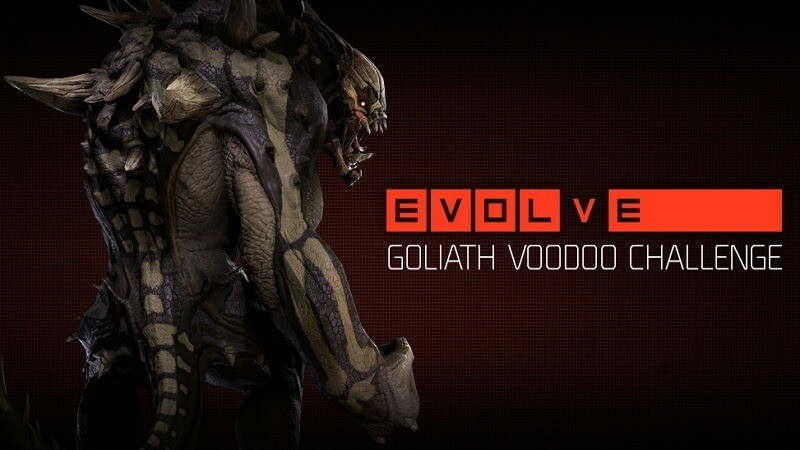 If the goal is reached, the Goliath Voodoo skin will be rewarded by Thursday April 16. The hundred people who still play only have to land about 10 000 rock throws apiece. Alright, that’s a huge exaggeration. However, the real numbers aren’t really that much better. At time of writing, there are currently 1313 players on Steam. That calculates to around 761 successful rock throws per person if the goal is to be reached. This of course is just PC. I assume they will be tallying the number of rock throws across the consoles too. I don’t think those numbers are much higher though. Personally, the possibility of a new skin doesn’t interest me in the slightest. What about you? Have you been playing Evolve religiously? Did you buy any of the new hunters?